LONDON – Timothy Ackroyd said he is in discussions to adapt for television his production of the courtroom drama “The Fuse”, which he wrote with the late Beryl Bainbridge. The sardonic and gripping play, which was presented recently as a Radio Theatre Production at the National Liberal Club, deals with the Old Bailey murder trial of Brian Donald Hume in 1950. Ackroyd – Sir Timothy off the stage – plays Hume, a shrewd fantasist who was charged with the murder of a shady London businessman and was freed when the jury could not reach a verdict. He later pleaded guilty as an accessory after the fact and was jailed for 12 years. Knowing he could not be tried again for murder, when he was released he sold a colourful confession to the tabloid press and left for the Continent. The play covers the first trial with Hume as a wisecracking observer of his own fate who claims to have been an RAF flyer and mocks the evidence that involves body parts on a plane, a Nazi dagger and a mistreated dog. Just as Orson Welles did decades ago, Ackroyd commissioned a short black-and-white film to precede the play with an outline of the crime and the publicity it generated. Directed by Edward Andrews with music by James Wilson-Rhead, cinematography by Joshua C. Fry, editing by Edward Andrews and art direction by Jenna Highcazony, it benefited from the art and wisdom of Ackroyd’s great friend, the filmmaker Nicholas Roeg. The short film plays just like the old Warner Bros. montages with spinning headlines, off-kilter shots and lots of chiaroscuro. It is crisp and intriguing and a dynamic tease for the play. Roeg would play a key role in the development of a TV adaptation, Ayckroyd tells me. The recent production, presented by Ragamuffin Productions and sponsored by EFG, featured professional actors such as Royce Mills, Simon Dutton, Nick Bayly, and Risemary Tross, along with Ackroyd. It also included non-pros and on first night there was some early nervousness that was dispelled on subsequent nights as the production gained more fizz and spirit. Mills has some funny moments as the often confused judge and while Ackroyd is naturally suave and charming as Hume, also he captures the man’s psycopathy so that by the end he has created a portrait of evil that is truly sinister. 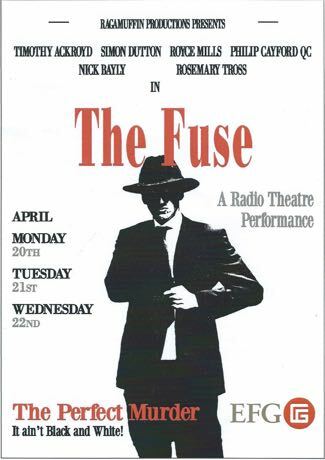 This entry was posted in News, Television, Theatre and tagged 'The Fuse', Beryl Bainbridge, Edward Andrews, National Liberal Club, Nicolas Roeg, Ragamuffin Productions, Royce Mills, Sir Timothy Ackroyd. Bookmark the permalink.